Realizing that since I have been working on promoting the ideas of entrepreneurship, especially among youth I also need to have some knowledge of theoretical aspects of entrepreneurship I had been looking around for some books on the subject when I bumped into management guru Peter F. Drucker's classic work Innovation and Entrepreneurship: Practice and Principles. I just completed reading the book and I must say despite being almost 3 decades old, the book is very interesting and pretty much relevant in current scenario. 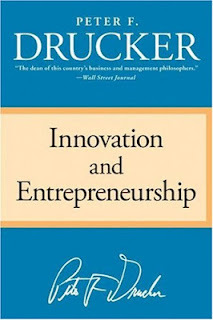 I was able to get some new insights about entrepreneurship which have refined my understanding about entrepreneurship. The confusion between entrepreneurship and business is prevalent in our society and I think with the increasing use of the words 'entrepreneurs' and 'entrepreneurship' to refer to any business venture-small or large, innovative or non-innovative, the distinction is getting even more vague which is unfortunate. Entrepreneurship is more about innovation than just a business. Innovation doesn't necessarily mean finding a new product or technology only, innovation is, in fact in most cases, about finding new ways of doing the same thing more effectively, recognizing the incongruity between the perception of consumers and producers, recognizing the changes in industry and market structure and adjusting products and services accordingly, planning and producing products and services according to the demographic structures of the society etc. For example, Ray Kroc, the founder of McDonald's, didn't invent the hamburger; he established a new system of clean, reliable, fast food delivery that created a whole new industry. Similarly, Henry Ford didn't invent the automobile and J. P. Morgan didn't invent banking; but they applied their imaginations to the systems by which cars were produced and money was exchanged. The author has distinguished between invention and innovation and has tried his best to dispel the "flash of inspiration' myth about entrepreneurs. With enough evidences and arguments he has asserted rather than the 'flash of inspiration' tremendous amount of hard work goes into every successful new enterprise. According to him, the process of entrepreneurship can be systematized and any company large or small can practice entrepreneurship. Although generally entrepreneurial working style shuns management because of the control and pre-defined framework required by the management, the author believes entrepreneurship can be and should be managed. In today's rapidly changing business environment and cut-throat competition, no company how big it is or how pervasive it is in the market can rest on its laurels. Every company should be continually looking around for innovation and improvements. And as per him, contrary to the popular notion, the last entry in this list, new knowledge, is the least reliable and least predictable of them all. An innovation must be simple and focused on a specific need. Towards the end of the book, he has also outlined some entrepreneurial strategies that are generally used by very innovative ventures to keep leading the market. 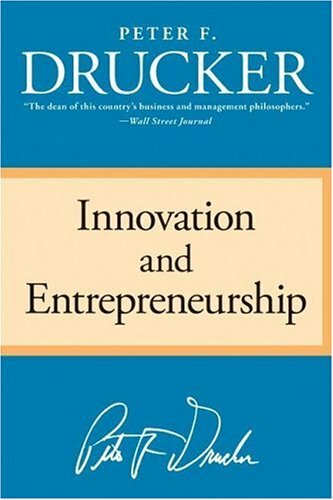 I found the book very insightful and a must read for anyone wishing to understand the process and principles of entrepreneurship. By the way, scribd.com hosts a free copy of the book at this link. If you are interested grab it before it gets deleted! !